Hello Spring….the signs of Spring are here, it must be April! We are all ready for a little more warmth from the sun, the spring green of the buds on the trees and those pretty pops of color in the yard from the crocus and the daffodils. Color changes everything, we as quilters know that with every quilt we create. Added brightness here, added depth of color there- color can change a quilt as much as it can change a feeling or an attitude. I know many of you came into the shop this cold, grey winter to be among the colors of the shop to drink in the brightness and the warmth of the fabrics and we love that we can be that place for you no matter the season. 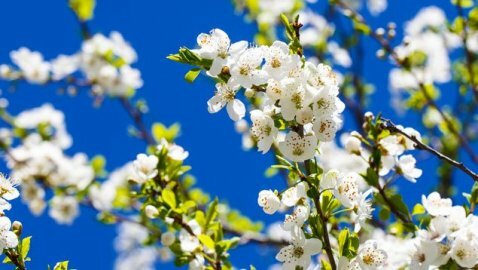 Enjoy the days as they become brighter with sunshine and the earth comes alive with color again and remember, we are here to help you capture the beauty of spring and every season in your quilts. Spring is filling us with lots of quilt inspiration and you can see what’s popping up in our quilter’s garden on Demonstration Day, April 5th at 10:30 am. Our theme for the month is "Five Alive!". From 5 inches to 5 yard projects, we have tips, patterns, books and fun rulers to put a “Spring” into your quilting. Join us for this free demonstration day April 5. 1st Friday Demo Day for April is "5 Alive!" "Five Alive!" will be our theme from 5 inches to 5 yard projects, patterns, books and ruler fun. Join us for "Five Alive" on April 5th It's Free! Join us on the First Friday of the month for Demonstration Day at the Shop. Bring your machine and spend the day with Joan. She will provide instructions for this easy exciting project. Bring a lunch or snacks. Reserve your space today. The Glimmer Quilt is made using the Super Sidekick ruler and the pattern has 5 different project size options! The Glimmer Quilt by Jaybird Designs is a radiating star quilt that goes together easily thanks to no Y- seams. The Glimmer Quilt uses the Super Sidekick Ruler also made by Jaybird Designs. The well laid out instructions and easy to use ruler makes this a quick to put together quilt. For this class you can choose the size quilt you want to make from a baby (44” x 44”), to small lap (60” x 60”) to large lap (74”x74”). Joan will be there to show you how to use the ruler and guide you through cutting and assembling the quilt top. This quilt would look great in any number of fabric combinations and the quilt pieces are large enough to use fabrics with medium to large scaled motifs too. *There are a number of other quilt patterns by Jaybird Quilt Designs that you can use the Super Sidekick ruler on so this is not a one and done ruler. Do you have an Accuquilt Go! 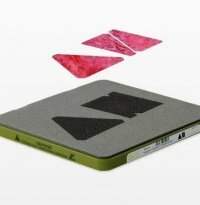 Cutting system? Come spend the day with us cutting, sewing and learning more about how your accuquilt system can save you time on cutting your blocks so you have more time to quilt! Come with a plan for a quilt project or just come in to play, either way we will be there to help you and share new ideas and projects. 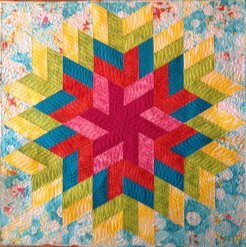 Darla will demonstrate how to cut bindings for your quilts using the Accuquilt 2.5" strip die so if you want to give it a try bring some practice fabric. We would love to have you join us for this all day come and go as you want event. $5 off GO!® dies priced $29.99 to $49.99. $10 off GO! dies $59.99 and up. Excludes all GO! Qube™ products (55775, 55776, 55777, 55778, 55783, 55784, 55785, 55786, 55787, 55788, 55789, 55790, 55791, 55797, 55798, 55799). Prices as marked. Offers not valid on previous orders. Develop your Skills - Take a Class! 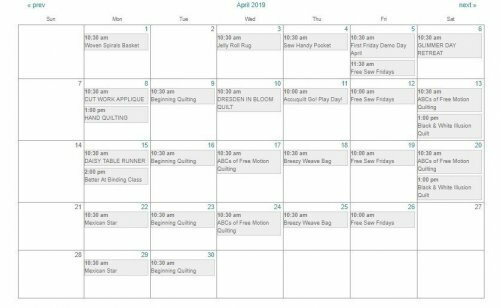 We have a full slate of classes scheduled for April to boost your skills or challenge you with a fun new project. Linda has scheduled several classes and don't miss Darla's new Sew Handy Machine Pocket! Of course, Joan will offer Free Motion and Beginning Quilting classes along with other standing class options. 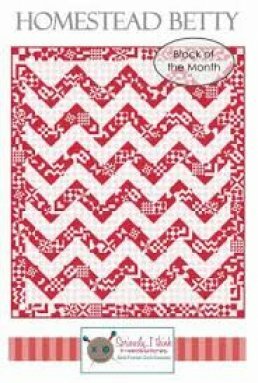 Month 3 Blocks for our "Homestead Betty" Block of the Month are ready for pick up as of April 5th. With the sun starting to shine as spring approaches, it will not be long before we open the doors and windows to let some fresh air in and sweep out the winter. After a long winter of projects, it’s time to consider a “Spring Cleaning” for your machine. Use a brush or a vacuum to dust off your machine being sure to clean the vents holes, bobbin holder and case. A small brush attachment attached to the end of a vacuum hose works well. NEVER use compressed air to ‘clean’ your machine! It may also be time to place a drop of oil on the hook mechanism. If you have an Elna or Janome this will be the small wick that is visible through the hole in the bottom of the bobbin case. Just one drop of Sewing Machine oil is all it takes. If it has been more than one year since your machine has been serviced, consider having it cleaned and lubricated. When this service is performed, the panels are removed allowing a full cleaning and lubrication of the internal mechanisms. Machines are designed to manage a certain level of dust and debris but after a while these materials build up and begin to invade gears that result in stress on the motor and noisy operation. Sew it’s time for Spring Cleaning!